Nannuo mountain is famous in China and abroad as the home of the "King of Tea Tree," a human cultivated 800 year old tree. Excellent ecological conditions, Nannuo mountain tea trees are large-leaf arbor-type, plant diseases and insect pests are less and do not need any pesticide. 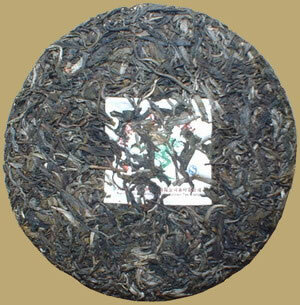 Fine tea tree varieties and superior natural conditions produce outstanding Nannuo mountain tea products. This nice raw cake was compressed by stone mold - traditional Bingcha processing method to avoid breaking tea leaves. The tea can be drank now and enjoyed by those who appreciate the fresh and sweet tastes experienced throughout 10-20 infusions, or put away for aging.